Everything apart from the weather went to plan for the tenth annual Fleetwood Triathlon. The event was again a sellout, although the near 600 competitors had to contest strong winds and rain as they left the pool for the other two components: cycling and running along the outer promenade. More than 150 children aged seven and upwards were among those who braved the elements. Organiser Tim Armit said: “We can’t believe this is the tenth year. “ When Ian Munro of Wyre Council brought the event to the town we had no idea it would grow and grow. “We now have people racing from Bath, Bucks and London. 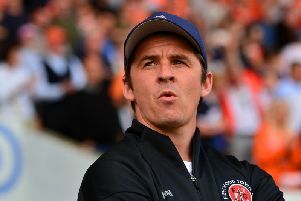 “We have helped to put Fleetwood on the map and people love coming here. The winner and the only racer to break the hour barrier was Mark Chadwick of Wigan Triathlon Club in a combined time of 59.53.35. Steve Abbott was second (64.40.15) and Martin Coulthurst third (64.41.95). Kelly Warrington was the first lady and 30th overall in 71.31.90. Lauren Brook of Rossall Triathlon club was second (34th) in 72.05.55 and Rachel Whitwell third (37th) 72.44.70. Winners in the youth categories were as follows. The race was also the final event in the annual Fylde Tri-logy series, which also includes the triathlons in Ribby Hall and St Annes. The overall series winners were Martin Coulthard and Caroline Betmead after a great year’s racing. Armit added: “Our marshals are amazing. They stand in those conditions for six hours and cheer every racer. “The YMCA, Marine Hall, The Mount and Wyre Council are all amazing in making this event happen.